KUCHING, Friday – The 19th Rainforest World Music Festival has clocked in a staggering 18,340 people in attendance throughout the duration of three days. The number of attendees has seen an increase of 2% from the previous year. Ticket sales for the Festival have also increased by 14% as opposed to last year’s sales. Survey forms at the event have made it easier to gauge what can be improved in the festival, and the Board will continue with greening efforts including composting, to ensure improvement in more than just performance standards. “This gradual growth is very promising, as we evolve to keep up with and incorporate international standards of festival excellence, and we hope to see an even greater increase next year.” Says Acting Chief Executive Officer (CEO) of Sarawak Tourism, Madam Mary Wan. The Board promises even better results for next year’s Festival as new ventures are being taken to better the quality of the festival, including ‘headhunting’ local talents and extended greening efforts such as recycling and composting, all of which has garnered positive feedback from the public. “It is not good enough to be an internationally recognized Festival, we want to be internationally lauded, and we hope that in time we can achieve our objectives of being an acknowledged benchmark in the World Music Festival scene.” the CEO of Sarawak Tourism Board and Permanent Secretary to Ministry of Tourism, Sarawak, Datu Ik Pahon Joyik responded when asked concerning future hopes for the festival. The 2017 Rainforest World Music Festival will be celebrating its 20th anniversary, and the Board plans on making it an unforgettable experience for new and long-time attendees. “It’ll be a great celebration of everything we’ve accomplished thus far; for our 10th anniversary, we brought back the best performers from the previous festivals, and next year we plan to do something different but equally special,” explains Madam Mary. While hesitant to divulge any more information on the special plans for the 20th installment of the Festival, the Board ensures that it will be an experience that should not be missed. Rainforest World Music Festival 2017 takes place on 14-16 July and will once again be held at the Sarawak Cultural Village. 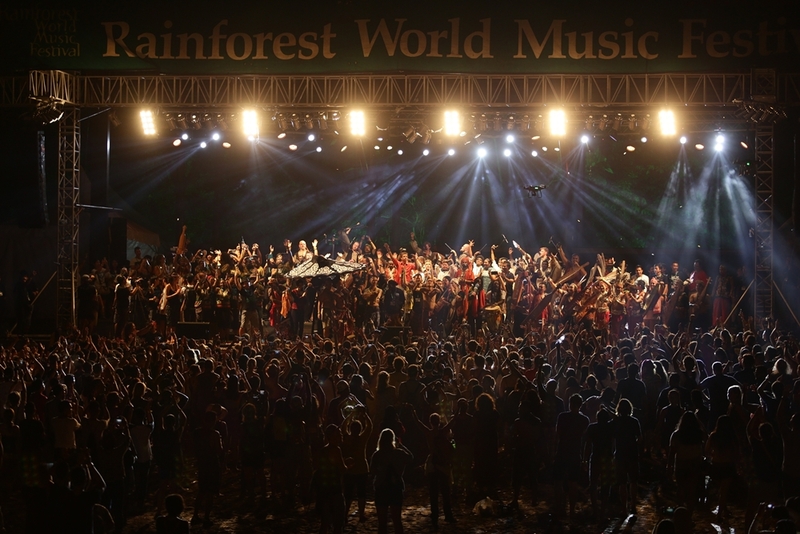 Picture below shows final bow of the Rainforest World Music Festival 2016 performers.